In this step we look a little closer into defining the critical capabilities used across the four operating models discussed in an earlier post (Big Data Analytics – Unlock Breakthrough Results: Step 3). We are going to assign relative weights to each of the critical capabilities groups for each operating model uncovered earlier. This is done to assign the higher weighting to capability groupings most important to the success of each model. Having the quantified index means we can evaluate each platform or tool for optimization within quickly and produce meaningful results. We already know a set of tools and platforms which are ideal for Centralized Provisioning are usually unsuited for use within a Decentralized Analytics operating model. In contrast critical capability essential to Embedded Analytics is very different from Governed Data Discovery. Yes there are some capabilities that cross operating models (e.g. metadata), and some that are far important than others. So what we are doing in this step is just gathering and validating the relative importance of each so form truly does follow function. This will become increasingly clear when building the decision models to guide our actions. 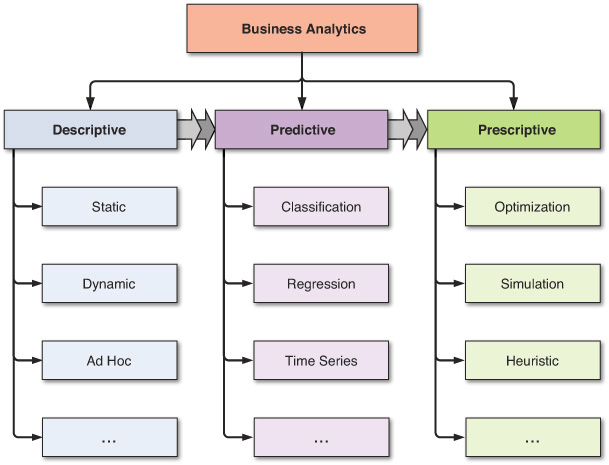 A Decision Model is a new way of looking at analytics using business logic. A key enabler sandwiched between BPM and Business Rules, the logic is captured and knits both together to illustrate what drives the decisions in a business. 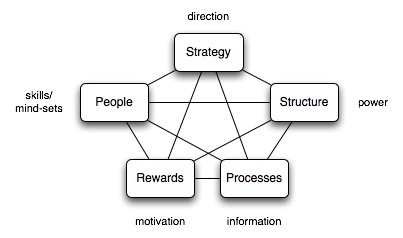 Instead of trying to capture and manage the logic one business rule at a time, a Decision Model groups the information sources, knowledge, and decisions (including the rules) into their natural logical groups to create the structure that make the model so simple to capture, understand, communicate and manage. Using this method we will be using a proven approach for solving platform and tool optimization in the same way that proven practice suggests every analytic decision be made. 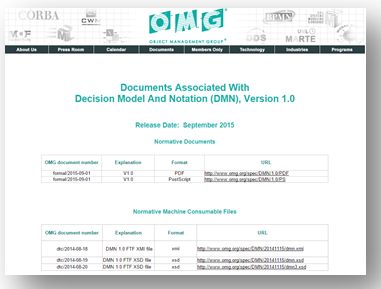 DMN provides the constructs that are needed to model decisions, so that organizational decision-making can be readily depicted in diagrams, accurately defined by business analysts, and optionally use to specify and deploy automated decision-making. The objective is to illustrate a method to address the perplexing management challenge of platform and tool optimization. In this step we are simply using an organizing principle to continue grouping and categorizing our findings quantifying each capability in its complexity and nuance across several facets. For more on this see the OMG specification released in September 2015. The purpose in all of this is arrive at some way to quantify which capability within each operating model is more important than the others; weighting their relative importance in satisfying need. In this step we are simply starting at a baseline. We can refine the critical analytic capabilities from this baseline to meet site specific needs before moving on to the weighting in the next step. Note these are high level summary weights. Each capability includes a number of different values or characteristics you can refine to any level of detail you believe necessary. They should all sum to the groups value (e.g. 20% for Platform Administration within the Centralized Provisioning model for example) to retain the integrity of the results. For each of the fifteen (15) groups of critical capabilities we assign weights to be used in later steps to evaluate the relative importance of each within each operating model. Note: the weights used in this example are based on the Gartner work referred to above. I have changed the metadata weighting to reflect my experience, leave the balance of the work to the next step after you have tailored this baseline to your environment and are ready to apply your own weighting. We have already seen there are very different needs required for each of the models presented. As the decision model is introduced and developed the data points for each can be used to develop quick snapshots and quantitative indexes when evaluating the form and function for each optimization in question. The fifteen (15) critical capabilities are now assigned relative weights used within each of the four operating models. We are now at a point where the analytic community profiles can be compiled to arrive at a defensible approach to quantifying the data used in the upcoming decision model. This has also helped clarify and understand the key capabilities that drive each operating model which we see can be very different as illustrated in the following diagram. If you enjoyed this post, please share with anyone who may benefit from reading it. And don’t forget to click the follow button to be sure you don’t miss future posts. Planning on compiling all the materials and tools used in this series in one place, still unsure of what form and content would be the best for your professional use. Please take a few minutes and let me know what form and format you would find most valuable. 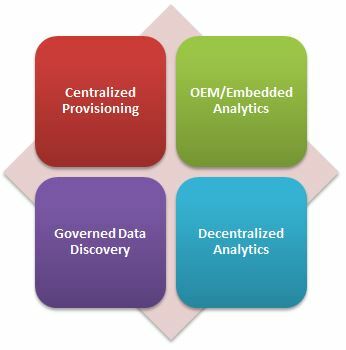 In this step I will dive deeper into defining the critical capabilities used across the four operating models discussed in an earlier post (Big Data Analytics – Unlock Breakthrough Results: Step 2). This may be a little boring for many and just a little too detailed for a medium like this. I believe it is important to always define your terms and create a controlled vocabulary so there is less of chance of friction or ambiguity in the decision model we will be developing. Seems old-fashioned and little of date in a world where Info-graphics and sound-bites are the preferred delivery medium. So at the risk of boring many, I’m going to just put this baseline out there and reference this work later when needed. A capability is the ability to perform or achieve certain actions or outcomes through a set of controllable and measurable faculties, features, functions, processes, or services. Capability describes “the what” of the activity, but not necessarily the how. Achieving success with big data means leveraging its’ capability to transform raw data into the intelligence to realize true actionable insight. Big data is a part of a much larger ecosystem and should not be viewed as a stand-alone solution that is independent of the other platforms available to the analytic community. The other platforms should be used to expand and amplify what is uncovered in big data using each of their respective strengths. There are other ways to view capability. See Critical Capabilities for Enterprise Data Science written by Dr. Jerry Smith that addresses Data Science in depth. His work represents a significant deep dive into the data science and a refinement of capability expressed at a much more granular level than I suggest here. The purpose in this effort is to organize and quantify which capability within each operating model is more important than the others; weighting their relative importance in satisfying need. In this step we are simply starting a baseline. We can refine the critical analytic capabilities from this baseline to meet site specific needs before moving on to the weighting in the next step. Note: the weights used in this example are based on the Gartner work referred to above. I have changed the metadata weighting to reflect my experience, will leave the balance of the work to the next step after you have tailored this baseline to your environment and are ready to apply your own weightings. We have already seen there are very different needs required for each of the models presented. A set of tools and platforms which are ideal for Centralized Provisioning may be completely unsuited for use within a Decentralized operating model. Critical capability essential to Embedded Analytic is very different from Governed Data Discovery. And of course there are some essential capabilities that will be shared across all operating models (e.g. 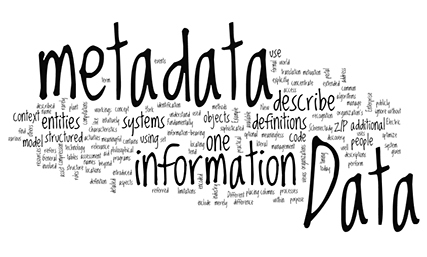 metadata). As the decision model is introduced and developed in later steps the data points for each can be used to develop quick snapshots and quantitative indexes when evaluating for form and function. I know this seems like a lot of work. Once completed you can always leverage this effort for solving for what can seem like bewildering array of choices and implications. Think of this as a way to introduce a taxonomy and a controlled vocabulary so all interested stakeholders have a way to discuss and think about each choice in a meaningful way. The following descriptions and characteristics of each of the fourteen (14) critical capabilities are presented to add additional context. While this is an important capability found across all operating models, it is most important to Decentralized Analytics and Governed Discovery success. Most often found in the Centralized Provisioning model, it can be useful in Governed Discovery as well. Almost always found in the Centralized Provisioning and to a lesser extent OEM/Embedded Analytics models. This capability group is important to Decentralized Analytics and Governed Discovery models. This capability is most important in Decentralized Analytics, Governed Discovery, and Embedded models. This capability is most important to Decentralized Analytics and Governed Discovery models. Relationships, products and services/programs that enable clients to be successful with the products evaluated. Specifically, this includes the ways customers receive technical support or account support. This can also include ancillary tools, customer support programs (and the quality thereof), availability of user groups, and service-level agreements. Examine the service level agreements (SLAs) and discover what the analytic community is happy with; or not. This capability is found across all operating models. The platform should provide a set of programmatic and visual tools and a development workbench for building reports, dashboards, queries and analysis. It should enable scalable and personalized distribution, scheduling, alerts, and workflow of content and applications via email, to a portal or to mobile devices. It should include the ability to embed and customize analytic platform components in a business process, application or portal. This group of capabilities is important to Centralized Provisioning and OEM/Embedded Analytics models. This is a combined grouping consisting of product quality, support, availability of skills, user support (which includes training, online videos, online communities and documentation) and migration difficulty. 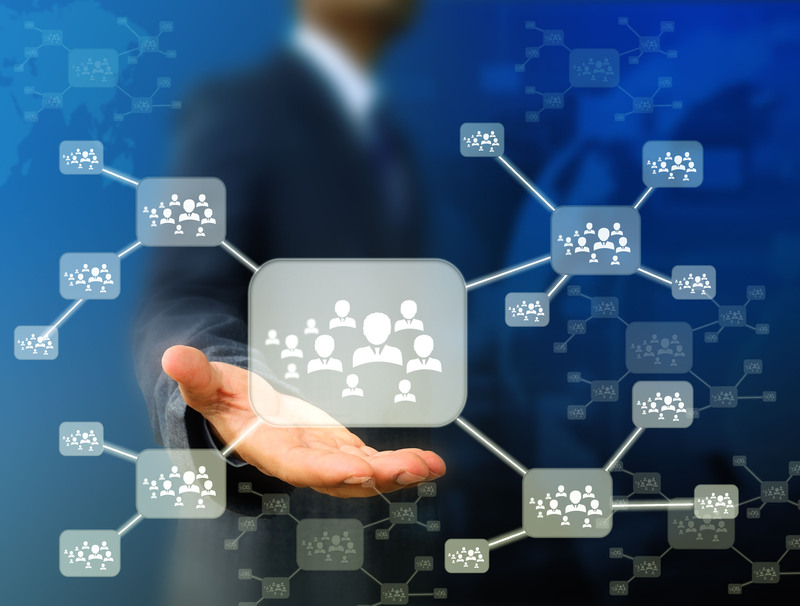 Closely related to Customer Service but different – this is all about the content available to analytic community. Important across all models especially critical in the success of Decentralized Analytics. – Capability to consume common methods, (ex; Predictive Model Markup Language (PMML) and SAS/R-based models in the metadata layer and in a report object or analysis application. This capability is important to the success of the OEM/Embedded Analytics model. This group of critical capabilities enables the exploration of data, manipulation of chart images, with the color, brightness, size, shape and motion of visual objects representing aspects of the data set being analyzed. This includes an array of visualization options that go beyond those of pie, bar and line charts, including heat and tree maps, geographic maps, scatter plots and other special purpose visuals. These tools enable users to analyze the data by interacting directly with a visual representation of it. What to look for? A common look and feel, install, query engine, shared metadata, promotability across all platform components. This capability is most important to Centralized Provisioning, Governed Discovery, and OEM/Embedded Analytic models. Platform and supporting tools used to enable users to leverage the same systems-of-record semantic model and metadata. They should provide a robust and centralized way for administrators to search, capture, store, reuse and publish metadata objects, such as dimensions, hierarchies, measures, performance metrics/KPIs, and report layout objects, parameters and soon. Administrators should have the ability to promote a business user-defined data mashup and metadata to the systems-of-record metadata. This capability is most important to Centralized Provisioning, Decentralized Analytics, and Governed Discovery models. Enables organizations to develop and deliver content to mobile devices in a publishing and/or interactive mode, and takes advantage of mobile devices’ native capabilities, such as touchscreen, camera, location awareness and natural-language query. This capability is important across all operating models. So there it is. The fourteen (14) critical capabilities organized as a baseline to be used within each of the four (4) operating models. We are now at a point where the data points can be weighted and combined with the community profiles (this is coming in another step) to arrive at a sound approach to quantifying the data used in the upcoming decision model. This post is part of a larger series to provide a detailed set of steps you can take to unlock breakthrough results in Big Data Analytics. The simple use case used to illustrate this method will address the perplexing management challenge of platform and tool optimization. 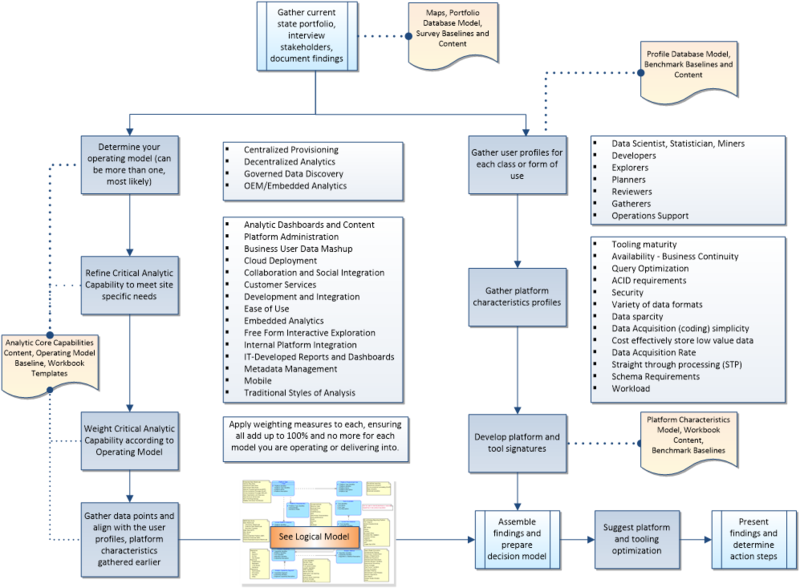 This step is used to identify the types and nature of the operating models used within the analytic community. I’m using a proven approach for solving platform and tool optimization in the same manner that proven practice suggests every analytic decision be made. Here we are simply using an organizing principle to group and categorize our findings in what can quickly become a bewildering experience (much like herding cats) in its complexity and nuance. Recall the nine steps to take as summarized in a prior post. 1) Gather current state Analytic Portfolio, and compile findings. 2) Determine the Analytic Operating Models in use. 3) Refine Critical Analytic Capabilities as defined. 4) Weight Critical Analytic Capability according to each operating model. 5) Gather user profiles and simple population counts for each form of use. 6) Gather platform characteristics profiles. 7) Develop platform and tool signatures. 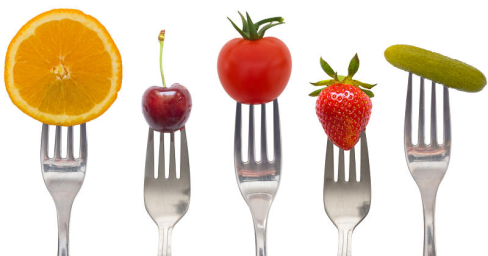 8) Gather data points and align with the findings. 9) Assemble decision model for platform and tooling optimization. Let’s start with examining the type and nature of the analytic operating models in use. Note an organization of any size will most likely use two or more of these models for very good reasons. I myself have seen all of these models employed at the same organization in my own practice. When moving on to the remaining steps it will become increasingly evident that having a keen understanding of the strategy, organization, technology footprint, and culture that drives the model adoption in question will become invaluable. First, let’s define our terms. Wikipedia defines an operating model as an abstract representation of how an organization operates across a range of domains in order to accomplish its function. An operating model breaks this system into components, showing how each works together. It helps us understand the whole. In our case we are going to focus on the analytic community and use this understanding to evaluate fit when making changes to ensure the enabling models will still work after the recommended optimization is called for. 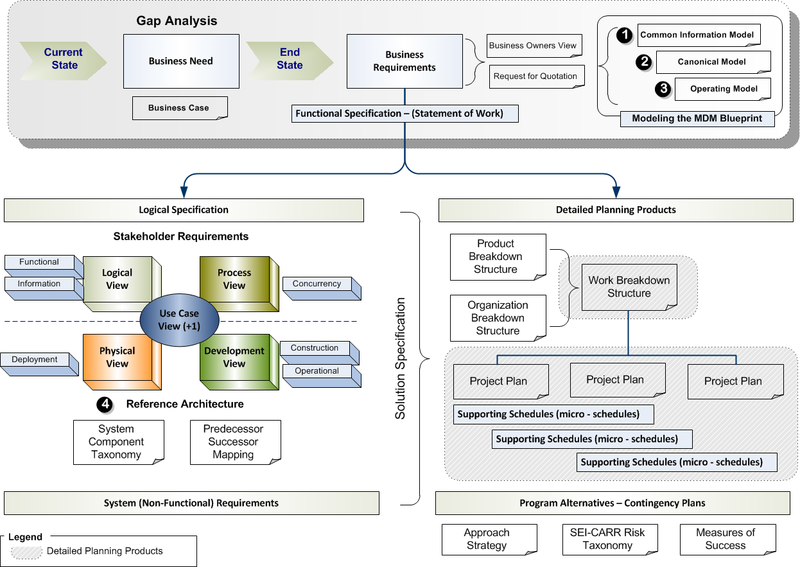 Thanks to Gartner who published Critical Capabilities for Business Intelligence and Analytics Platforms this summer (12 May 2015 ID:G00270381) we have a reasonably good way to think about form and function across the different operating models which Gartner refers to in their work as baseline use cases to include. You may think what you will about Gartner I believe they have done a good job of grouping and characterizing the signatures around the four (4) operating models using fifteen (15) critical analytic capabilities to further decompose the form and function found within each. At a summary level the capabilities are grouped as follows. Note: Detailed descriptions and characteristics of each of the fifteen (15) critical capabilities can be found in step three (3) where I will refine the Gartner definitions of Critical Analytic Capabilities to add additional context. Each of the four models have very different needs influenced by strategy, footprint, and culture of the organization. Each optimization will have to recognize their differences and accommodate for them to remain meaningful. A set of tools and platforms which are ideal for Centralized Provisioning are usually terrible and completely unsuited for use within a Decentralized Analytics operating model. Critical capability essential to Embedded Analytics is very different from Governed Data Discovery. Yes there are some capabilities that cross operating models (e.g. metadata), and some that are far important than others. In general this is a truly sound way to determine where your investment in capability should be occurring – and where it is not. Along the way you will surely stumble across very clever professionals who have solved for their own operating model limitations in ways that will surprise you. And some just downright silliness; remember culture plays a real and present role in this exercise. 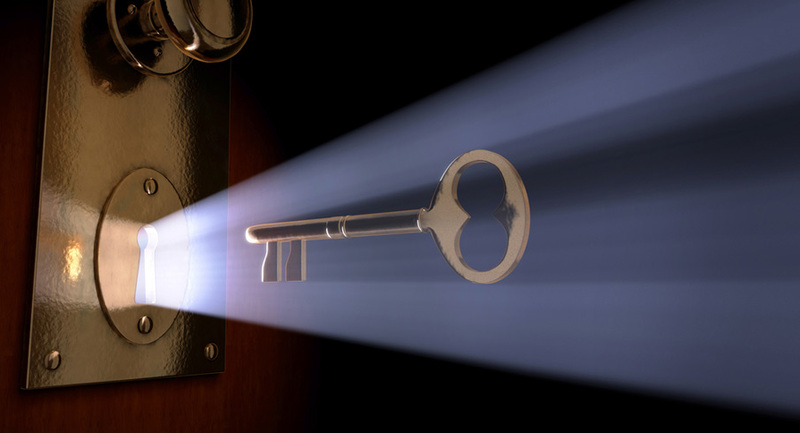 At a minimum I would think carefully about what you uncover across the following facets or dimensions. Structure is drawing boundaries for each analytic community, defining the horizontal mechanisms that ensure coordination and scale, and evaluating the resource levels that reflect the roles of the each. It should define the high-level organization chart if form follows function. If you look carefully, the clues to helping understand and classify each model are there. And note some overlap and redundancy is expected between each of the models. Accountability describes the roles and responsibilities of the organizational entities within each model and clarify how organizational units come together to make effective cross-enterprise analytic decisions. This is where a lot of organizational friction can occur resulting in undefined behaviors and unnecessary ambiguity. Governance refers to the configuration and cadence for discussing and resolving issues of strategy, resource allocation (including talent), performance management and other matters under each model. Note the wide variety of skills and competencies needed under each model and the potential for a rapid proliferation of tools and methods. Working describes how people collaborate across the seams that lie between different models. Behavior that’s consistent with intended values is critical to effective execution. Less understood by many, remember you really can’t do effective predictive or prescriptive analytic work without the descriptive or diagnostic data sets usually prepared by others under what is typically a very different operating model. Critical Capability can be determined by using the collection referred to above to balance people, processes and technology investment. The choice of operating models has implications for the type of talent or technology platform and tool optimization required. This collection is a suggestion only (and a good one at that), in step three I will refine this further to illustrate how to extend and refine this set of capabilities. In this step we are going to gather a deep understanding for the characteristics within each operating model, where they differ, and what common components and critical capability are shared. If you read the Gartner reference they consider metadata to be most heavily weighted in the Centralized Provisioning and Governed Discovery models. Based on my experience it is just as critical (and perhaps even more so) in the Decentralized model as well, especially in the Big Data world where tools like Alation, Adaptive, and Tamr are becoming essential to supporting discovery and self-service capability. The rest of this post will briefly describe the key characteristics for each operating model, their signature attributes, and highlight a few differences to help determine which operating models are employed. A hybrid of centralized and decentralized this model is best characterized by offering freedom within a framework to enhance transparency and effectiveness. This model features business users’ ability to prepare and combine data, explore and interact visually with this data to enable discovery to be deployed and managed across the enterprise. With the success of data discovery tools in driving business value, there is an increasing demand to use data discovery capabilities for a broader range of analysis and an expanded set of users than previously addressed by traditional reporting and dashboards. Governed data discovery enables users to access, blend and prepare data, then visually explore, find and share patterns with minimal IT support using their own technical and statistical skills. At the same time, this model must also satisfy enterprise requirements for business-user-generated model standards, data reuse and governance. In particular, users should be able to reuse sanctioned and approved business-user-created data or data sets, derived relationships, derived business models, derived KPIs, and metrics that support analyses. Governed data discovery can enable pervasive deployment of data discovery in the enterprise at scale without proliferating data discovery tooling sprawl. The expanded adoption of data discovery also requires analytic leaders to redesign analytics deployment models and practices, moving from an IT-centric to an agile and decentralized, yet governed and managed approach. This would include putting in place a prototype, pilot and production process in which user-generated content is created as a prototype. Some of these prototypes would need to be used in recurring analysis and promoted to a pilot phase. Successful pilots are promoted to production and operationalized for regular analysis as part of the system of record. Each step provides more rigor and structure in governance and Quality Assurance testing. Business user data mashup and modeling, administration, and metadata capabilities should be based understanding on the following characteristics which would differentiate a Governed model from the Decentralized Analytics model discussed earlier. Pursuing the following questions will help define the differences. – Where are permissions enabled on business models? – Who can access shared data connections and data sets? – Who can create and publish data sets? – Who can access shared user work spaces to publish visualizations? – Is there shared metadata about usage, connections and queries ? – Are usage, connections and queries monitored? – Is there a information catalog available to enable discovery? Believing form really does follow function it should be clear after this step what operating models are driving the platforms and tools that are enabling (or inhibiting) effective performance. Using the Gartner work and the refinements I have extended this with we can now see at a glance what core capabilities are most important to each model as illustrated in the following diagram. This will become a key input to consider when assembling the decision model and discovering platform and tooling optimization in the later steps. Now that this step is completed it is time to turn our attention to further refining the critical analytic capabilities as defined and begin weighting each according to their relative importance to each operating model. It will become increasingly clear why certain critical capabilities essential to one model will be less important to another when this task is completed. You’ve made the big data investment. You believe Nucleus Research when it says that an investment in analytics return a whopping thirteen (13) dollars for every one (1) dollar spent. Now it’s time to realize value. This series of posts is going to provide a detailed set of steps you can take to unlock this value in a number of ways. As a simple use case I’m going to address the perplexing management challenge of platform and tool optimization across the analytic community as an example to illustrate each step. This post addresses the first of nine practical steps to take. Although lengthy, please stick with me, I think this you find this valuable. I’m going to use a proven approach for solving platform and tool optimization in the same manner that proven practice suggests every analytic decision be made. In this case I will leverage the CRISP-DM method (there are others I have used like SEMMA from SAS) to put business understanding front and center at the beginning of this example. 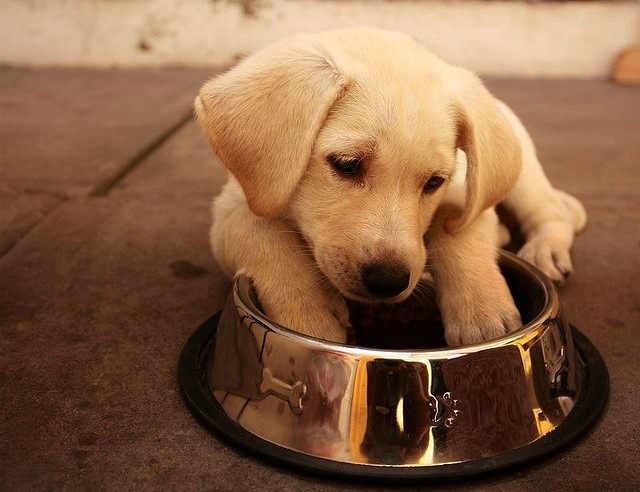 Yes, I will be eating my own dog food now (this is why a cute puppy is included in a technical post and not the Hadoop elephant) and getting a real taste of what proven practice should look like across the analytic community. Recall the nine steps to take summarized in a prior post. 1) Gather current state analytics portfolio, interview stakeholders, and compile findings. 3) Refine Critical Analytic Capabilities as defined to meet site specific needs. 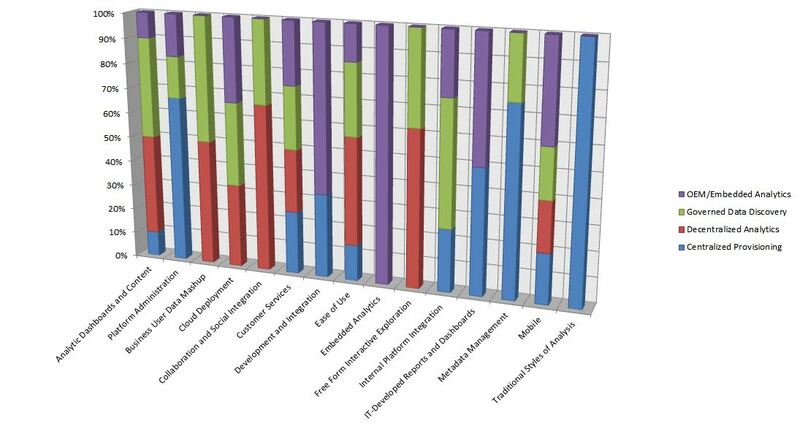 4) Weight Critical Analytic Capability according to each operating model in use. 9) Assemble findings and prepare a decision model for platform and tooling optimization. Using the CRISP-DM method as a guideline, we find that each of the nine steps corresponds to the CRISP-DM method as illustrated in the following diagram. Note there is some overlap between understanding the business and the data. The models we will be preparing will use a combination of working papers, logical models, databases, and the Decision Model Notation (DMN) from the OMG to wrap everything together. In this example the output product is less about deploying or embedding an analytic decision and more about taking action based on the results of this work. The goal is to gather the current state analytics portfolio, interview stakeholders, and document our findings. In brief, this will become an integral part of the working papers we can build on in the steps to follow. This is an important piece of the puzzle we are solving for. Do not even think about proceeding until this is complete. Note the following diagram (click to enlarge) illustrates the dependencies between accomplishing this field work and each component of the solution. If form follows function, this is where we begin to uncover the underlying analytic processes and how the business is organized. Understanding the business by evaluating the organization will provide invaluable clues to uncover what operating models are in use. For example, if there is a business unit organized outside of IT and reporting to the business stakeholder, you will most likely have a decentralized analytics model in addition to the centralized provisioning most analytic communities already have in place. Start with the organization charts; but do not stop there. Recommend you get a little closer to reality in the interview process to really understanding what is occurring in the community. By examining the underlying processes this will become clear. For example, what is the analytic community really doing? Do they use a standard method (CRISP-DM) or something else? An effective way to uncover this beyond the simple organization charts (which are never up-to-date and notorious for mislabeling what people are actually doing) is using a generally accepted model (like CRISP-DM) to organize the stakeholder interviews. This means we can truly understand what is typically performed by whom, using what processes to accomplish their work. And where boundary conditions exist or in the worst case are un-defined. An example is in order. Using the CRISP-DM model we see there are a couple of clear activities that typically occur across all analytic communities. This set of processes is summarized in the following diagram (click to enlarge). Gathering the analytic inventory and organizing the interviews now becomes an exercise in knowing what to look for using this process model. For example, diving a little deeper we can now explore how modeling is performed during our interviews guided by a generally accepted method. We can structure questions around the how, who, and what is performed for each expected process or supporting activity. Following up on this line of questioning should normally lead to samples of the significant assets which are collected and managed within an analytic inventory. Let’s just start with the modeling effort and a few directed questions. Which organization is responsible for the design, development, testing, and deployment of the models? How do you select which modeling techniques to use? Where are the assumptions used captured? How do you build the models? Where do I find the following information about each model? Are anticipated reporting requirements identified? How is model testing designed and performed? Is a regular assessment of the model performed to recognize decay? When you hear the uncomfortable silence and eyes point to the floor you have just uncovered one meaningful challenge. Most organizations I have consulted into DO NOT have an analytic inventory, much less a metadata repository (or even a simple information catalog) I would expect to support a consistent, repeatable process. This is a key finding for another kind of work effort that is outside the scope of this discussion. All we are doing here is trying to understand what is being used to produce and deploy information products within the analytic community. And is form really following function as the organization charts have tried to depict? Really? An important note: we are not in a process improvement effort; not just yet. 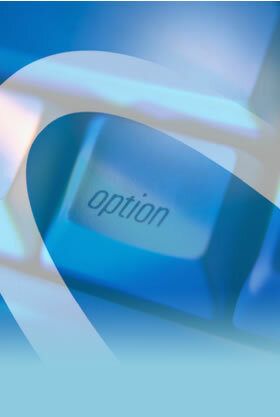 Our objective is focused on platform and tool optimization across the analytic community. Believing form really does follow function it should be clear after this step what platforms and tools are enabling (or inhibiting) effective response and solving for this important and urgent problem across the organization. If you are lucky there will be an enterprise data model or someone in enterprise architecture who can point to the major data sources and where the system of record resides. These are most likely organized by subject area (Customer, Account, Location, etc.) 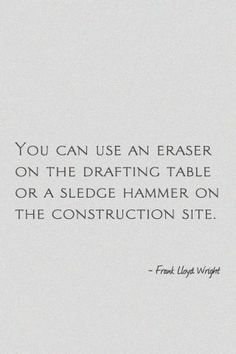 and almost always include schema-on-write structures. Although the focus is big data, it still is important to recognize that vast majority of data collected originates in transactional systems (e.g. Point of Sale). Look for curated data sets and information catalogs (better yet an up-to-date metadata repository like Adaptive or Alation) to accelerate this task if present. While modelling techniques for structured information have been around for some time, semi-structured and unstructured information formats are growing in importance. 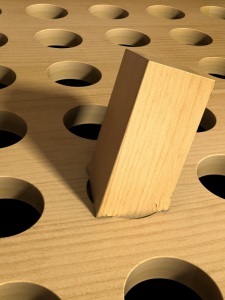 Unstructured data presents a more challenging effort. Many believe up to 80% of the information in a typical organization is unstructured this must be an important area for focus as part of an overall information management strategy. It is an area, however, where the accepted best practices are not nearly as well-defined. Data standards provide an important mechanism for structuring information. Controlled vocabularies are also helpful (if available) to focus on the use of standards to reduce complexity and improve reusability. When we get to modeling platform characteristics and signatures in the later steps the output of this work will become increasingly valuable. I have grouped the analytic environments, tools, and underlying technologies together in this step because they are usually the easiest data points to gather and compile. This simple classification scheme can be extended to include lower level nodes and improved granularity if needed. 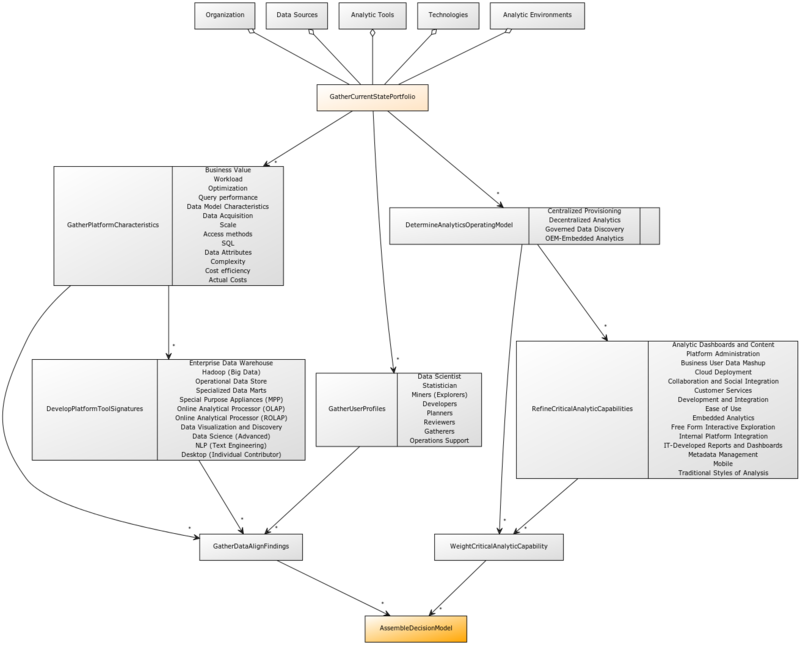 The following diagram illustrates a graphical depiction of the simple taxonomy developed by INFORMS and widely adopted by most industry leaders as well as academic institutions. Even though these three groupings of analytics are hierarchical in complexity and sophistication, moving from one to another is not clearly separable. 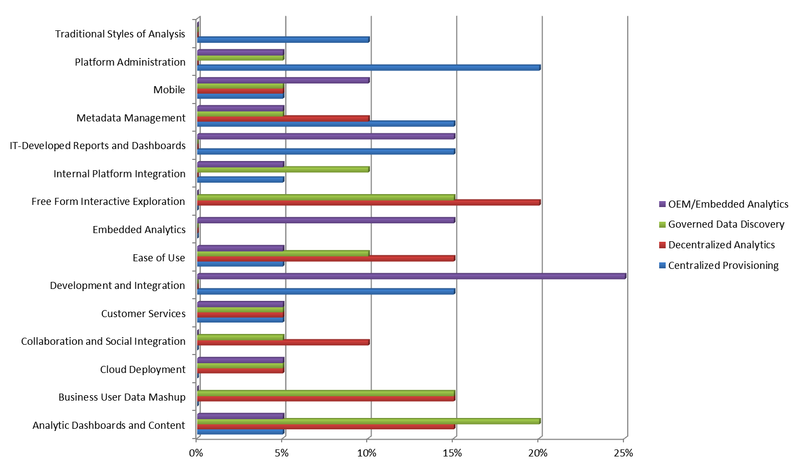 That is, the analytics community may be using tools to support descriptive analytics (e.g. 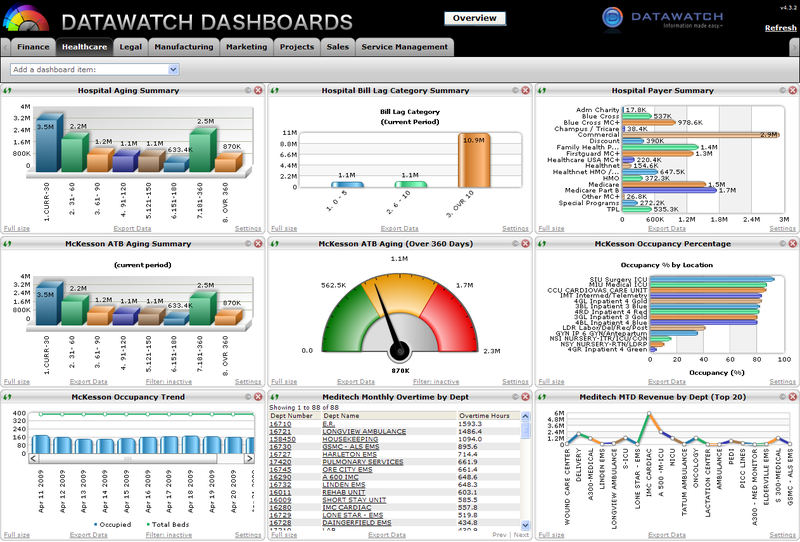 dashboards, standard reporting) while at the same time using other tools for predictive and even prescriptive analytics capability in a somewhat piecemeal fashion. And don’t forget to include the supporting tools which may include metadata functions, modeling notation, and collaborative workspaces for use within the analytic community. Technologies in use can be described and grouped as follows (and this just a simple example and is not intended to be an exhaustive compilation). Not that we have compiled the important information needed, where do we put this for the later stages of the work effort? In an organization of any size this can be quite a challenge, just due to the sheer size and number of critical facets we will need later, the number of data points, and the need to re-purpose and leverage this in a number of views and perspectives. Here is what has worked for me. 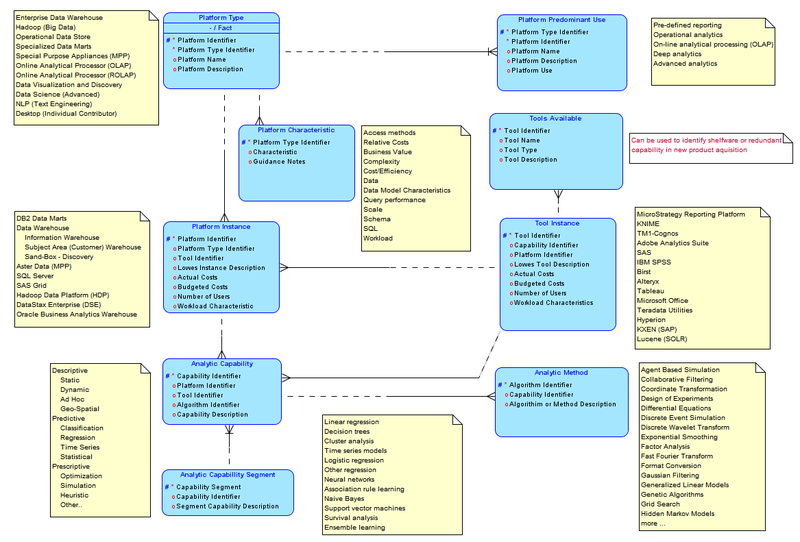 First use a mind or concept map (Mind Jet for example) to organize and store URIs to the underlying assets. Structure, flexibility, and the ability to export and consume data from a wide variety of sources is a real plus. The following diagram illustrates an example template I use to organize an effort like this. Note the icons (notepad, paperclip, and MS-Office) even at this high level point to a wide variety of content gathered and compiled in the fieldwork (including interview notes and observations). 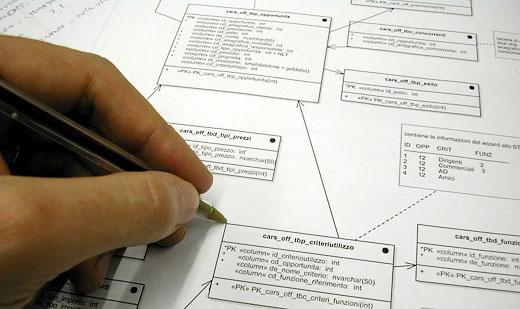 For larger organizations without an existing Project Portfolio Management (PPM) tool or metadata repository that supports customizations (extensions, flexible data structures) it is sometimes best to augment the maps with a logical and physical database populated with the values already collected and organized in specific nodes of the map. A partial fragment of a logical model would look something like this, where some sample values are captured in the yellow notes. Armed with the current state analytics landscape (processes and portfolio), stakeholder’s contributions, and the findings compiled we are now ready to move on to the real work at hand. 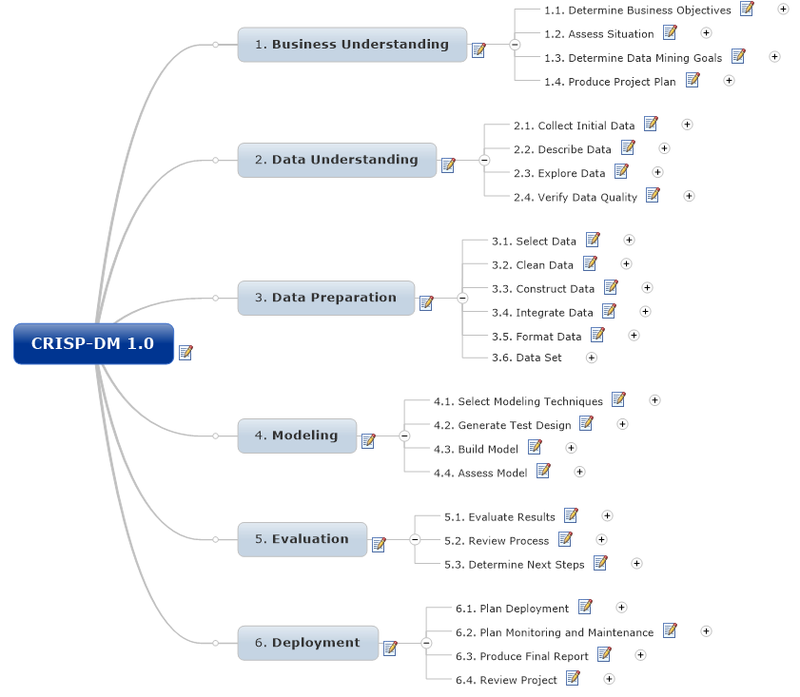 In step (2) we will use this information to determine the analytics operating models in use supported by the facts. An earlier post addressed one of the more perplexing challenges to managing an analytic community of any size against the irresistible urge to cling to what everyone else seems to be doing without thinking carefully about what is needed, not just wanted. This has become more important and urgent with the breath-taking speed of Big Data adoption in the analytic community. Older management styles and obsolete thinking have created needless friction between the business and their supporting IT organizations. To unlock breakthrough results requires a deep understanding of why this friction is occurring and what can be done to reduce this unnecessary effort so everyone can get back to the work at hand. There are two very real and conflicting views that we need to balance carefully. The first, driven by the business is concerned with just getting the job done and lends itself to an environment where tools (and even methods) proliferate rapidly. In most cases this results in overlapping and redundant expensive functionality. Less concerned with solving problems once, the analytic community is characterized by many independent efforts where significant intellectual property (analytic insight) is not captured and inadvertently placed at risk. The second view, in contrast, is driven by the supporting IT organization charged with managing and delivering supporting services across a technology portfolio that values efficiency and effectiveness. The ruthless pursuit of eliminating redundancy, leveraging the benefits of standardization, and optimizing investment drive this behavior. So this is where the friction is introduced. Until you understand this dynamic be prepared to experience organizational behavior that seems puzzling and downright silly at times. Questions like these (yes they are real) seem to never be resolved. – Why do we need another data visualization tool when we already have five in the portfolio? – Why can’t we just settle on one NoSQL alternative? – Is the data lake really a place to worry about data redundancy? 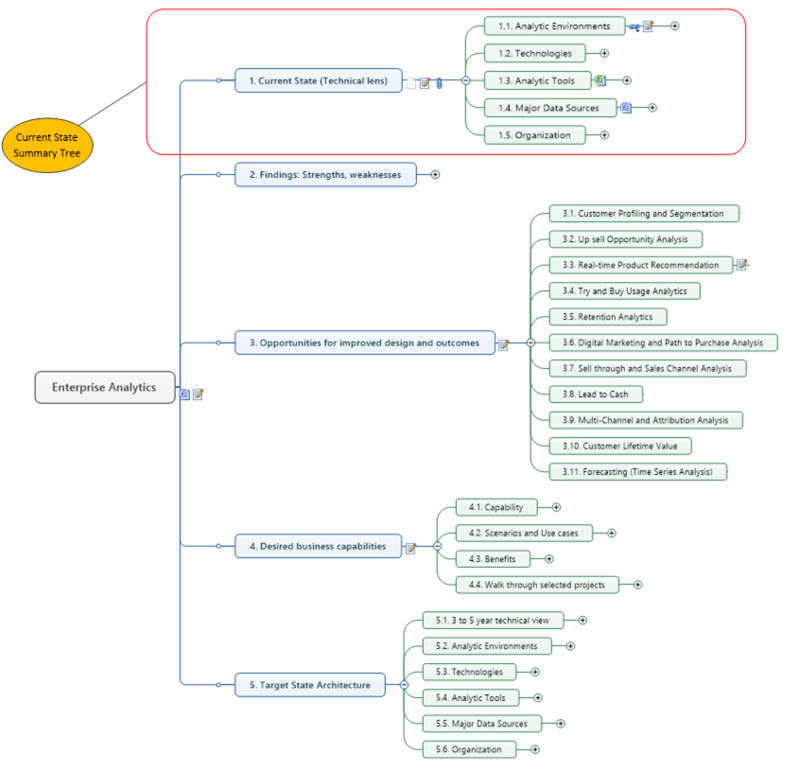 – Should we use the same Data Quality tools and principles in our Big Data environment? So I’m going to share a method to help resolve this challenge and help focus on what is important so you can expend your nervous system solving problems rather than creating them. Armed with a true understanding of the organizational dynamics it is now a good time to revisit a first principle that form follows function to help resolve and mitigate what is an important and urgent problem. For more on this important principle see Big Data Analytics and Cheap Suits. This method knits together several key components and tools to craft an approach that you may find useful. The goal is to organize and focus the right resources to ensure successful Big Data Analytic programs meet expectations. Because of the content delivered believe I will just break this down into several posts, each building on the other to keep the relative size and readability manageable. This approach seemed to work with earlier series on Modeling the MDM Blueprint and How to Build a Roadmap so think I will stick to this method for now. So presented here is a simplified method to follow to compile an important body of work, supported by facts and data to arrive at any number of important decisions in your analytics portfolio. The following diagram illustrates the method graphically (click to enlarge).